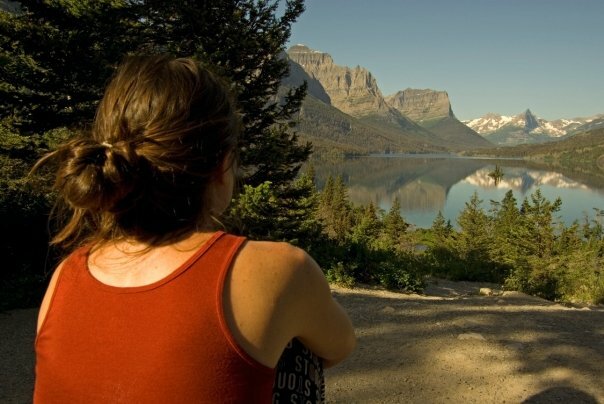 Pictures say a thousand words – Glacier National Park photos say a million. View the 10 best photographs of Glacier National Park, including wildlife, hikes, waterfalls, attractions, hotels and more! For those who have never been on a Glacier National Park, Montana vacation, all they can do is, ‘Ooohh’ and ‘Aaahhh’ when looking through an album of Glacier photos. For those who have seen the park’s immense beauty firsthand, Glacier National Park photos can make their heart skip a beat. In looking through my collection of hundreds of Glacier National Park pictures, it’s hard to choose favorites. Each has a special memory attached to it, a backstory, and can send a flood of emotions through me. However, I pride myself as a photographer who knows how to take a good picture. While these may not be the best Glacier National Park photos, they are my favorite and hopefully they make your heart skip a beat, too. Do YOU have photos from Glacier that make YOUR heart skip a beat? Then share them here, or view other photos from our visitors! Over the years, I have used three different cameras to capture pictures of Glacier National Park. One was an ancient digital camera, another a basic point and shoot, and the third a Pentax K10d dSLR. 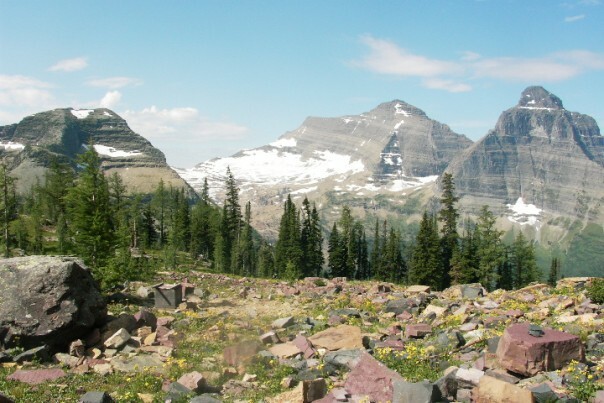 On this page you will find the best of the best Glacier National Park pictures. The remaining Glacier National Park photos are divided up into a few sections, which you can easily access at the bottom of the page. Below are my favorite (aka best) Glacier National Park photos that I have taken. Not only does each have a special memory and story associated with it, but they all are pretty damn good pictures. I hope your heart skips a beat when viewing these Glacier National Park images and it makes you salivate about the thought of returning to Montana. Welcome to Glacier National Park! Every Glacier National Park vacation must have a picture of Glacier National Park’s entrance sign. 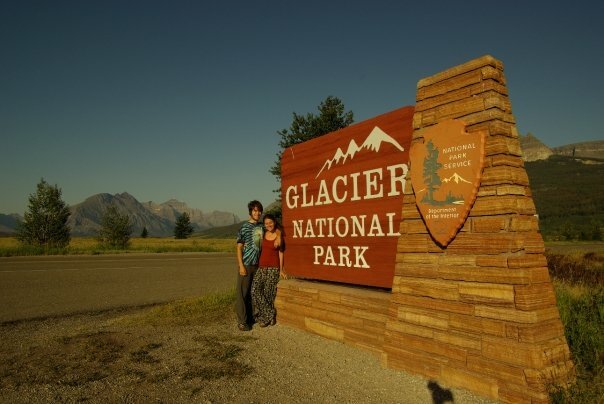 This photograph is of my girlfriend and I at Glacier National Park’s entrance. As you can tell, we’re in our pajamas (the picture was actually taken at the end of our trip, not the beginning). This is at St. Mary’s entrance to Glacier National Park. It was taken on a tripod with my dSLR so that we could make this Glacier National Park picture perfect. This Glacier National Park photograph is taken on the shores of Swiftcurrent Lake. 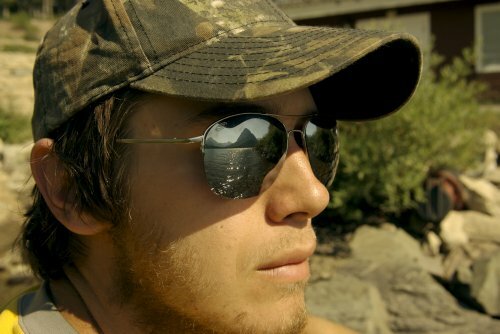 I’ve always been a fan of unique pictures and I love how you can see the reflection of Swiftcurrent Lake and the mountain in my sunglasses. 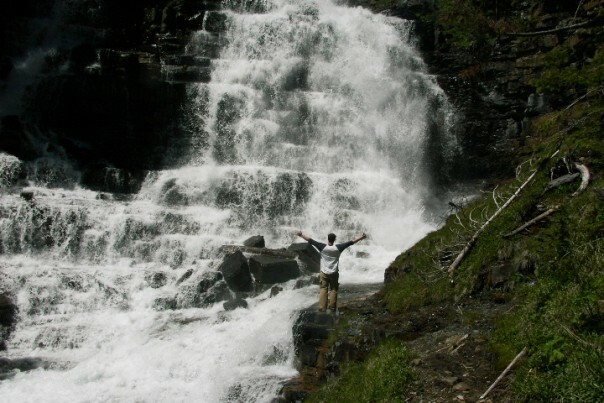 This natural waterfall picture is of Florence Falls, a waterfall off the Gunsight Trail in Glacier National Park. It was early season (late June), so the snow melt made the waterfall intense! You could hear the water rushing down the rocks from about a mile away. This picture encapsulates the feeling this scene gave us perfectly. 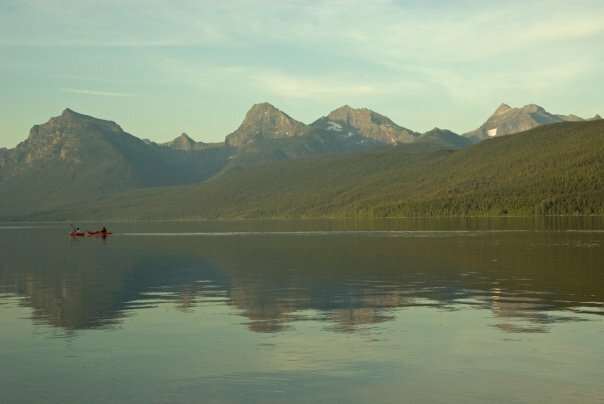 This photograph is of Wild Goose Island, Glacier National Park’s most photographed location. Allyson and I woke up early and we spent a solid hour at Wild Goose Island lookout so that I could perfect this picture. I think I took more photos of Allyson’s back while in Glacier than of our faces, but it still makes for a great Glacier picture. Iceberg Lake is one of Glacier National Park’s best (and most popular) hiking trails. It’s in the Many Glacier region, so wildlife is abundant (we saw a Grizzly Bear on this hike!) and the lake is super cool with icebergs floating in it. 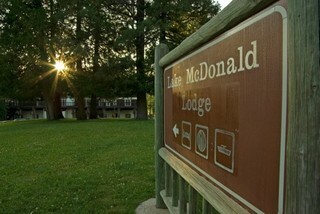 When I had my National Park job, I worked in Lake McDonald Lodge. This picture of Lake McDonald Lodge was taken on my most recent trip with a dSLR. The reflection in the sign, lodge in the distance, and sun peeking through the trees makes this one of my ten best Glacier National Park pictures. This picture of two kayakers in Lake McDonald was taken on the first night of my most recent Glacier National Park vacation. 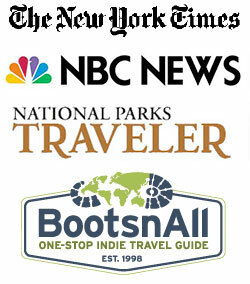 Glacier National Park campgrounds fill up fast, so camping can be difficult. If you find a great campsite, keep it for a few days. This picture was taken about ten feet away of one of the best Glacier National Park camping spots. Very peaceful way to end the evening. 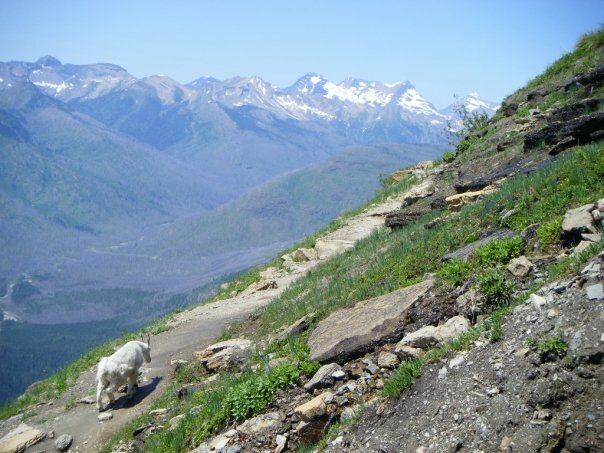 This mountain goat pic was taken on the Highline Trail in Glacier National Park. One of the best mountain goat images I’ve ever taken (or seen). Too bad it wasn’t taken on my dSLR. Have any of these Glacier National Park photos taken your breath away yet? If this one didn’t, then none will! Boulder Pass is in one of the most remote corners of Glacier National Park. It’s wilderness and beauty is unmatched. Backpacker Magazine did a section on views from pit toilets and ranked the view from Boulder Pass’ pit toilet as number one. Can you blame them? 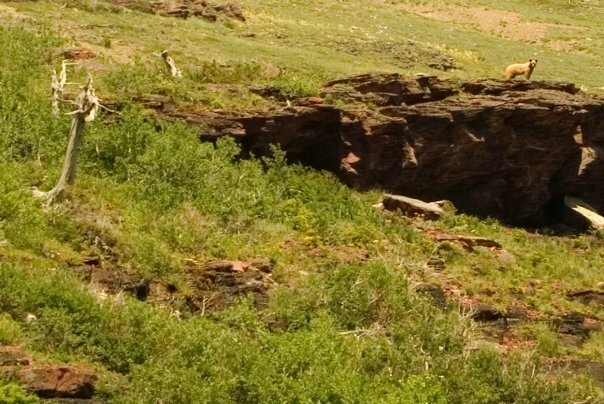 The pit toilet is on the left hand side to the right of the big boulder. What a view! Okay, not the best Grizzly Bear photo–but really, do you want to get any closer? I know we didn’t! We saw this Grizzly Bear on Iceberg Lake trail in Glacier National Park. We walked parallel to him for about 15 minutes, camera flashing all the while. I so wish I brought the longer lens so that I could get a better picture of this Grizzly Bear’s face, but oh well. Pretty cool photo of a Grizzly Bear anyway.